The entirely voluntary Spider and Harvestman Recording Schemes are run under the auspices of the British Arachnological Society . One of the main aims of the recording schemes is to provide up-to-date data on the distribution and autecology of spiders and harvestmen in Britain. The data available on this website have been gathered by the Spider Recording Scheme (SRS) since 1987. The distribution maps and summary charts on this website are generated from the latest data available to the recording scheme. Everyone can help submit records of some easily recognisable spiders which are not easily confused with other similar species and you can submit identification questions or observations of interest etc on the forum. Overall coverage is good, although not surprisingly it is patchy in some areas, with some counties intensively recorded, whilst other areas remain more poorly covered. 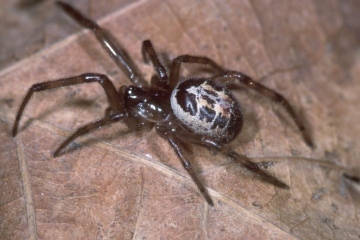 There are a number of Steatoda species found in Britain, all so-called 'false widow' spiders. For more information see the False widow spiders page on this website and the BAS website . Provisional maps with species accounts and phenology charts were published in 2002. Since that time the Spider Recording Scheme has placed greater emphasis on autecology and phenology, and has the following objectives. In order to achieve these objectives, arachnologists should, as far as possible, record spiders using the structured methodology developed after the publication of the provisional atlas. Please don’t be put off by what may seem like an undue demand for detail. In practice the minimum acceptable record to the scheme would comprise date, locality, 4-figure grid reference, collector and identifier, preferably with information on habitat. On the other hand, remember that information not submitted is effectively lost and cannot help improve our understanding. You can see examples of what our objectives can provide for each species using the A-Z Species Index or find out more.... However the gathering of autecological data is still in its early stages, and there is a long way to go with this if we are to gain good countrywide coverage. 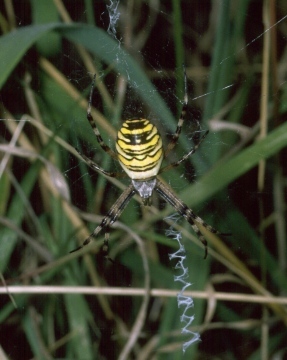 You can help by recording spiders using the Phase 2 structured methodology and providing these data to the national recording scheme, preferably using the biological recording and mapping software MapMate. These data can then be easily provided to the scheme through your Area Organisers and uploaded to this website.